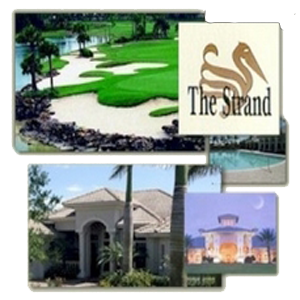 The Strand is a 575-acre planned community located in North Naples off of Immokalee Road just west of Interstate-75 and consists of a 30-acre shopping and commercial area plus 545 acres of residential areas, a 27-acre championship golf course, lakes and preserves. There is a full compliment of multi-family and single-family homes to choose from. Golf, tennis, fitness and clubhouse facilities, which include all of the social membership privileges.